The judgment in Secretary of State for EFRA v Meier  UKSC 11 is one of three handed down this week. The judgment was given nearly 6 months after the case was heard in the House of Lords – a period of delay which is often thought to indicate a strong difference of view amongst the justices. If so it is one which has now been resolved, with only differences of nuance appearing in what is now a unanimous court. The decision resolves an important but narrow issue that has troubled the traveller community since the judgment in Secretary of State for the Environment v Drury  EWCA Civ 200; 1 WLR 1906), namely whether a possession order made against trespassing travellers can extend to land they have not yet occupied. While the case does not raise human rights issues, it can be read in the context of the debate over the role of Article 8 rights in possession proceedings (see Doherty v Birmingham City Council  UKHL 57), a subject recently addressed in a lecture by Lord Neuberger. 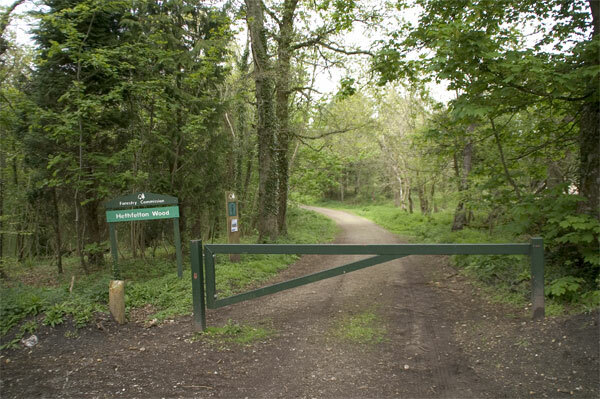 The traveller appellants in Meier set up camp in Hethfelton Woods in Dorset in 2007 (pictured above). These woods were managed by the Forestry Commission and owned by the Secretary of State, who issued possession proceedings against the travellers claiming possession and an injunction over an area that encompassed other woods in addition to Hethfelton. At first instance, the Recorder granted only a possession order in relation to Hethfelton. The Court of Appeal (Pill, Arden and Wilson LJJ  EWCA Civ 93;  1 WLR 828) reversed the decision, granted the injunction and, following Drury, found that an order for possession could extend to land not forming part of, or contiguous with, the land actually occupied by trespassers where there was a substantial risk that at least some of the travellers would move onto other such woods once an order for possession was made in relation to Hethfelton. The Supreme Court unanimously held that the decision in Drury was wrong. The first Judgment was given by Lord Rodger who presided. Lord Walker gave a one paragraph concurring judgment. Lady Hale and Lord Neuberger gave substantive concurring judgments. Lord Collins gave a two paragraph concurring judgment. Lords Rodger and Neuberger considered that CPR 55 did not provide a legal basis for extending possession orders to encompass land not already occupied. In any event, such an order made no sense – the Secretary of State enjoyed uninterrupted possession of the other woods and could not logically seek to recover what he already possessed. The natural remedy for threatened incursion into property was an injunction and the Justices unanimously upheld the Court of Appeal’s grant of the injunction. Lady Hale noted that landowners have a right to “self-help” and any judicial remedy should be efficacious enough to help avoid resort to forceful ejection of trespassers. She suggested that the “incremental development” sanctioned in Drury might be acceptable if the possession order could be “specifically tailored against known individuals who have already intruded upon the claimant’s land, are threatening to do so again, and have been given a proper opportunity to contest the order”. Lord Neuberger discussed the effect on the grant of an injunction of the “Guidance on Managing Unauthorised Camping” issued in 2004 by the Office of the Deputy Prime Minister. This suggests that local authorities and other public bodies distinguish between unauthorised encampment locations which are “unacceptable” (for instance, because they involve traffic hazard or public health risks) and those which are “acceptable”. It further recommends that the “management of unauthorised camping must be integrated”, and states that “each encampment location must be considered on its merits”. The Recorder had considered that it was inappropriate to grant an injunction in favour of the Secretary of State because the Commission had not complied with the 2004 Guidance in relation to the other woods before issuing the proceedings, and would not give an assurance that it would comply with the 2004 Guidance before it enforced the injunction but the Court of Appeal disagreed. Lord Neuberger was of the same view, holding that the Guidance was not an obstacle to the grant of an injunction. All three Justices who gave substantive judgments felt that there was scope for reform in this area. The authors of any such reform should bear in mind the travellers’ plight as emphasised by Lord Neuberger at the start of his judgment. He noted the “acute shortage of sites” for travellers with the “inevitable consequence” that they trespass. As he reminded us in his lecture, recent case law from the European Court of Human Rights is likely to reopen the question of Article 8 and possession proceedings. Meier may have resolved the physical scope of possession orders but there will doubtless be further judicial consideration of landowners’ and travellers’ rights more generally. Quite how such an injunction would work in practice remains to be seen. The Supreme Court noted the difficulties in enforcing such injunctions – particularly in the case of vulnerable individuals and persons unknown – but seemed attracted by the deterrent effect that such orders might have. The net result may be that trespassers will be less inclined to identify themselves in the future for fear of being made a defendant to injunction proceedings. The Supreme Court did not give any criteria or guidelines for the grant of an injunction in this type of case which has potentially wide ramifications for travellers. It seems likely that public bodies will be encouraged by this judgment to seek wide ranging quia timet injunctions to restrain travellers from trespassing on their land in circumstances where travellers continue to face serious practical problems in finding sites. Leave a reply on "Case comment: Secretary of State for EFRA v Meier  UKSC 11 [updated]"